Not being mistaken for anything else, the plumose anemone (Metridium senile) stands out. 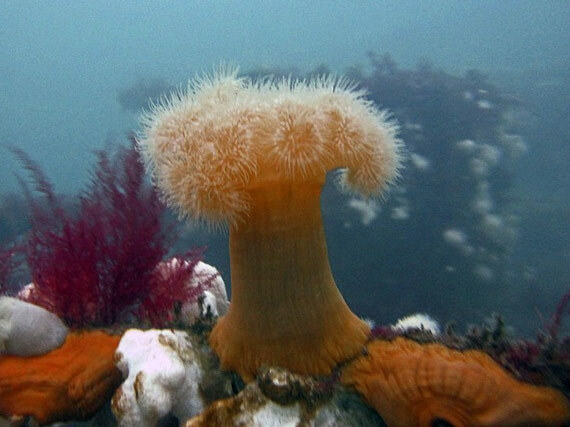 As the biggest anemone in the UK it has been known to reach sizes of 30cm in height and have a tentacle span of up to 15cm. Enjoying the company of others its rare to find these by themselves. The tentacles on this anemone are slightly different however. They are short and numerous giving a fluffy appearance on top rather than the finger-like projections of most anemones. These tentacles will be used for capturing any organisms that go floating by and keeping away any competing species. Anemones make up part of the phylum cnidaria along with jellyfish, corals and hydroids. Cnidaria simple means ‘stinging cells’ which all these invertebrates have as either a prey capture mechanism or predatory defence. Being a relatively sessile species they have another line of predatory defence, which is to tuck all the tentacles into the column until the threat has passed. This drastically changes the appearance and accessibility. There are over 1,000 different types of anemones, the most familiar being the ones associated with clownfish in tropical waters. Can be found in recreational depth all the way down to 100m.